Like previous years, AMD has released the big update of its graphics drivers. This year (or rather for 2019), no new codename, the Adrenalin name seems ok for the marketing team. AMD is excited to release the 5th Generation of our Software: AMD Radeon™ Software Adrenalin 2019 Edition. 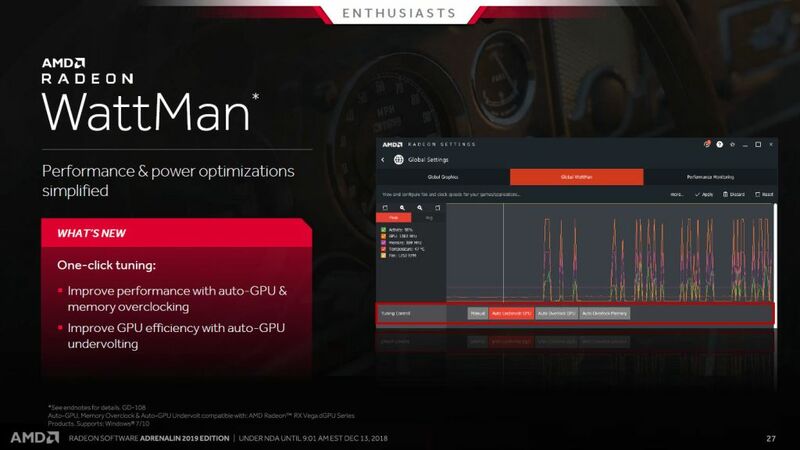 Radeon™ Software Adrenalin 2019 continues to be focused on developing the best tools and experiences for gamer’s, developers and professionals making it the ultimate tool to explore the full power of your AMD Radeon™ GPU – unlocking new levels of adjustment & tunability, unleashing powerful performance, and providing leading-edge stability. – In-Game Replay feature that allows you to replay your gaming moments instantly on screen. – Scene Editor allows creation and editing of scenes for recording or streaming with transitioning options via hotkeys or Radeon Overlay. – GIF Support allows creation of GIFs via hotkey or Radeon Overlay. – Added platform connection support for Restream.io, Streamable and Gfycat. – Multi-channel audio support and 16:9 streaming support. – Bringing Radeon gaming quality to your mobile devices allowing up to 4K 60fps low latency gaming with hardware acceleration. Seamlessly transition from your PC to your phone or tablet. Free on both Android and iOS via the AMD Link app. – Bringing ultra-high PC quality VR experiences to standalone VR devices with low-level hardware acceleration optimized for streaming and recording. – Streaming enabled via Steam®, the Steam®VR ecosystem* and available through the Radeon ReLive VR app. – Better reliability for a stable connection. – Get started easily with a redesigned connection process. – Upgrade Radeon Software through your phone. 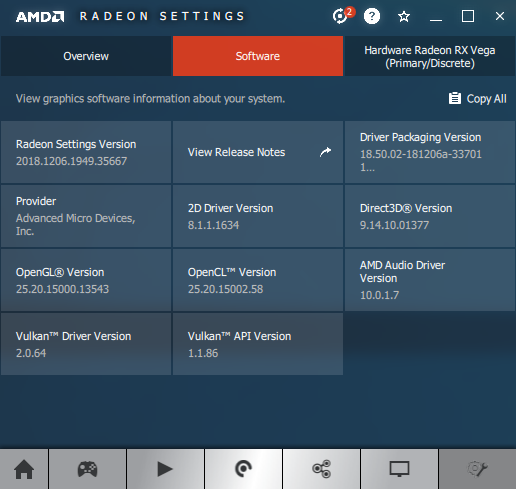 – Voice Controls for Radeon ReLive and Performance Metrics. – Enhanced Performance metrics for capturing average, max and min FPS. – Radeon ReLive support allows viewing screenshots, playing back video, cropping video and saving video to your mobile device. – Enhanced Sync controls available in display tab with per game real-time adjustment. – Radeon FreeSync controls now found in display tab. – Per-game color controls now available in display tab. – Radeon WattMan is now supported in Radeon Overlay allowing for in-game power and performance optimizations. – Performance Metrics Overlay now supports visual customization with adjustable colors, columns, position, transparency and size. – Performance Metrics Overlay now supports a lower sample interval and frame-time measurement logging. – Measures game performance and generates a detailed report with suggestions to improve performance or increase image quality. Available through Radeon Overlay. – Scans your system’s capabilities and provides optimization suggestions in just a few simple clicks. Available through Radeon Settings. – One click tuning with Auto Overclock GPU, Auto Overclock Memory and Auto Undervolt GPU. – Change fan speed with temperature dependent fan curves and Zero RPM fan control. 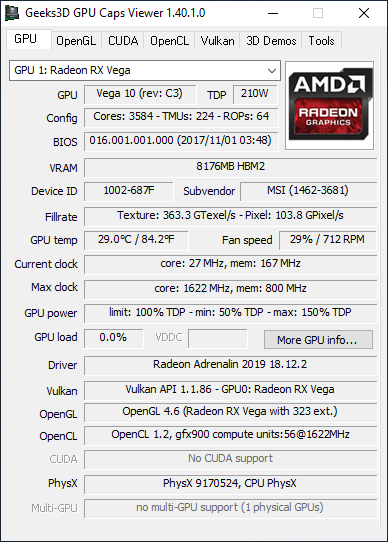 – Unlocked Radeon RX Vega series DPM states for finer power adjustments. – Targeted optimization of memory bound applications with new memory tuning feature. – Improved Radeon Chill efficiency allows increased power savings. – Improved Radeon FreeSync 2 with auto-tone mapping for a more detailed experience in HDR 10 supported games. – Now supports ultra-wide 21:9 displays. – A new one-click express install option is now available with installation progress and percentage indicators. Nothing particular here, still OpenGL 4.6 like previous Adrenalin drivers. All OpenGL extensions are available HERE.